Pashusavardhan Vibhag Bharti 2019 is started by Pashusavardhan Vibhag for 729 posts of Pashudhan Paryavekshak & Parichar. Pashusavardhan Vibhag Bharti is going to conduct under Maharashtra Mega Bharti. Maharashtra government officially declared about Mega Bharti before some days. 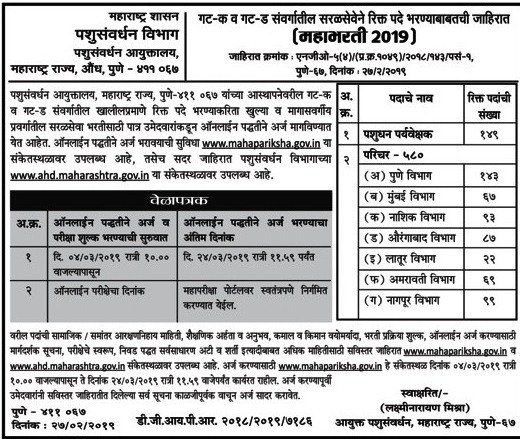 Online applications for Pashusavardhan Recruitment is starting from 4 March 2019 and the last date for submitting the application form is 24 March 2019. AHD Maharashtra Recruitment is organized for a total of 729 posts and inviting to fill the online application form in 7 Divisions. This recruitment conducting for Group “C” and Group “D” level posts. Here we will update you about Pashusavardhan Vibhag Hall Ticket 2019 and Pashusavardhan Answer Key once it is available to download for all the applicants. महाराष्ट्र पशुसंवर्धन विभागात मेगा भरती जाहीर झाली आहे. पशुधन पर्यवेक्षक व परिचर पदांच्या 729 जागेसाठी हि भरती आयोजित केली आहे. या भरतीविषयी सर्व माहिती या ठिकाणी Update करण्यात आली आहे. As we posted above about total vacancies in Pashusavardhan Vibhag Recruitment 2019 i.e. 729 Posts are going to recruit in this Mega Bharti. Below are some highlights of this recruitment. There are a total of 729 posts are available in this Pashudhan Recruitment. 2 types of posts in this recruitment and details about them is given below. Below is the complete Division wise distribution of posts for Peon (परिचर). You need to visit on Mahapariksha Portal for submitting the online application form. You need to keep a soft copy of your passport size photo and your own signature while applying for any post of Pashusavardhan Bharti. Also, carry a Credit card or Debit card (If you don’t have Net Banking) with you for paying Application Fees. You can also pay fees by BHIM UPI service. After Submitting an online application form, don’t forget to take the print out of your application form for confirmation. 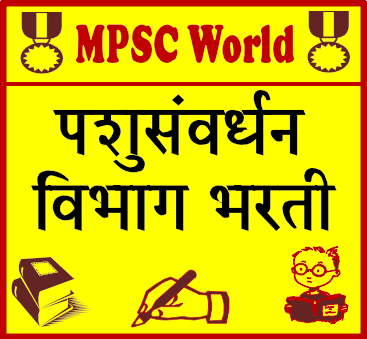 Pashusavardhan Vibhag Recruitment is going to conduct in all districts of Maharashtra. Here we are providing all the details regarding Pashusavardhan Vibhag Bharti of all districts. Bharti process is still pending in many districts, so there is no link given below regarding pending districts. We will update here when any other district published the notification regarding Pashusavardhan Vibhag Bharti. Please check below links of your respective district. please update the information …thank u very much……!